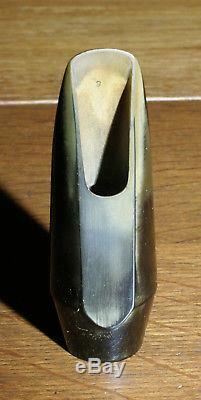 This is a rather rare mouthpiece that was made by MC Gregory as a Gale Companion. Marked 3s, it has a. My belief is that this was finished and faced by MC Gregory as his work characteristically has very thin side and tip rails. This is from the Theo Wanne Mouthpiece Museum website; The Companion is a later model of the Hollywood. It has a bit more roll over at the baffle and a little more edge to the sound. Otherwise it is very similar to the Hollywood model. The shank design changed as did the logo font. 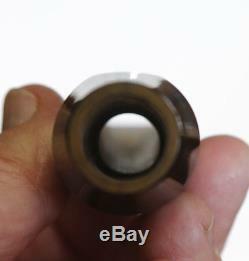 It is possible that these GALE mouthpieces with the flat GALE logo instead of round logo, might have been produced at the J. Babbitt factory in the late 1960s. 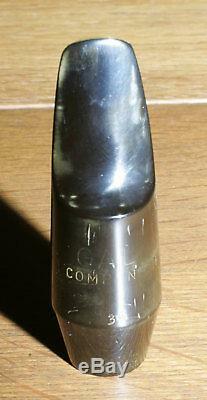 Gale Companion mouthpieces were some of the last mouthpieces to be offered by the M.
Gregory company before it was bought out by Charles Bay in 1969. As to be expected, these are great mouthpieces. These mouthpieces are very similar to the earlier Gale Hollywood models, except they tend to have a little bit more edge, or bit to their sound. They were most likely made on the same molds as the the Hollywood models. The item "Vintage Gale Companion Alto Saxophone Mouthpiece 3s (made by MC Gregory)" is in sale since Friday, February 02, 2018. This item is in the category "Musical Instruments & Gear\Wind & Woodwind\Parts & Accessories\Mouthpieces". The seller is "housedoggy" and is located in Richmond, California. This item can be shipped to United States, Canada, United Kingdom, Denmark, Romania, Slovakia, Bulgaria, Czech republic, Finland, Hungary, Latvia, Lithuania, Malta, Estonia, Australia, Greece, Portugal, Cyprus, Slovenia, Japan, Sweden, South Korea, Indonesia, Taiwan, Thailand, Belgium, France, Hong Kong, Ireland, Netherlands, Poland, Spain, Italy, Germany, Austria, Russian federation, Israel, Mexico, New Zealand, Philippines, Singapore, Switzerland, Norway, Saudi arabia, Ukraine, United arab emirates, Qatar, Kuwait, Bahrain, Croatia, Malaysia, Chile, Colombia, Costa rica, Panama, Trinidad and tobago, Guatemala, Honduras, Jamaica, Antigua and barbuda, Aruba, Belize, Dominica, Grenada, Saint kitts and nevis, Saint lucia, Montserrat, Turks and caicos islands, Barbados, Bangladesh, Bermuda, Brunei darussalam, Bolivia, Ecuador, Egypt, French guiana, Guernsey, Gibraltar, Guadeloupe, Iceland, Jersey, Jordan, Cambodia, Cayman islands, Liechtenstein, Sri lanka, Luxembourg, Monaco, Macao, Martinique, Maldives, Nicaragua, Oman, Pakistan, Paraguay, Reunion.